Impact Finance Center welcomes readers to our new Impact Newsletter, a bi-monthly communication about our work and the work of our partners in the impact investing field. A busy November at IFC promises to identify hundreds of quality social ventures seeking capital while simultaneously inspiring more funders to take their first steps along the impact investing journey. We hope you can join us November 8 to celebrate leaders and success stories in this growing movement. 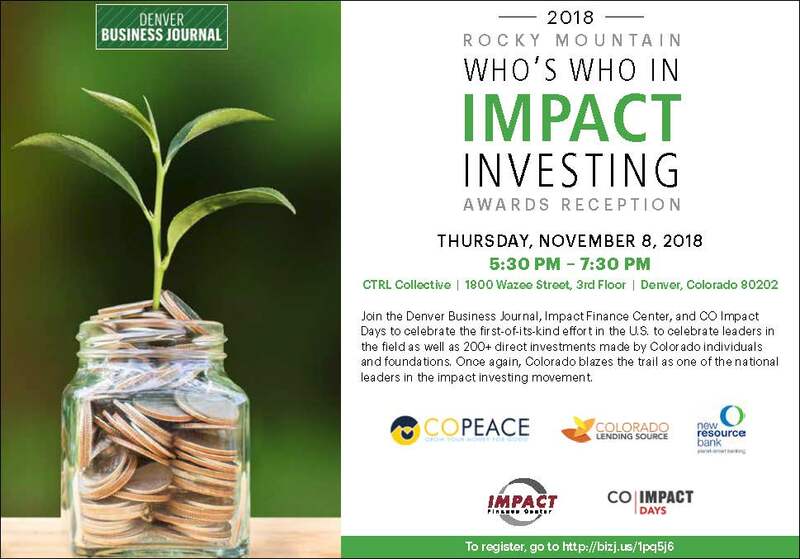 At the CTRL Collective that evening, we will announce our 2019 Call for Social Ventures and Opportunity Zones and recognize the Rocky Mountain Who’s Who in Impact investing from 5:30 - 7:30 pm. It is not too late to RSVP here. The second annual Who’s Who edition of the Denver Business Journal hits newsstands on November 2, spotlighting our region’s movers and shakers in impact investing with a goal of connecting new investors to the expertise and technical assistance required to make their first direct impact investment. Online edition here. Impact Finance Center (IFC), which includes flagship initiatives CO Impact Days (Impact Days), CO Impact Investing Education Institute (IIEI), and Rocky Mountain Who’s Who in Impact Investing (Who’s Who), seeks a fiscal sponsorship and/or Impact Lab Partners (I-Lab) with a community foundation, private foundation, and/or philanthropic supporting organization. Please contact Dr. Stephanie Gripne if you would like additional information. How many direct impact investments have been made in Colorado since 2012? Let’s go find out. Let us know if you want to join the committee led by University of Colorado PhD student Jessica Jones who is leading the first statewide evaluation. We have completed over 170 presentations and courses to more than 5,000 participants as part of CO Impact Education Institute and CO Impact Days, which together, have showcased more than 150 social ventures, connecting them to mentors, partners, and impact investment capital. Early estimates indicate that 258 direct impact investments of $201M have been completed. Please contact Dr. Stephanie Gripne if you would like additional information. Impact Finance Center recently paid back a $100,000 2% loan made from a donor-advised fund by Rose Community Foundation. This is the the second successful loan that IFC paid back. The first loan was for $40,000 at 4%. Please contact Dr. Stephanie Gripne if you would like additional information. Nov 29: Everyday Heroes: Impact Investing Stories from the Field: Jean Hammond of LearnLaunch and Impact Investor and Elizabeth Garlow of Lumina Foundation's Lumina Impact Ventures. March 12-14: CO Impact Days. Request an invitation here. Lastly, if you want to donate, we could not do this work without your support. We look forward to keeping you updated on impact investing activities and successes in the coming months!